While most of Rolex’s tool watches began their lives as utilitarian, stainless steel timepieces made to serve a practical purpose, many of these models have grown to become luxurious sports watches available in a slew of materials and colorways. 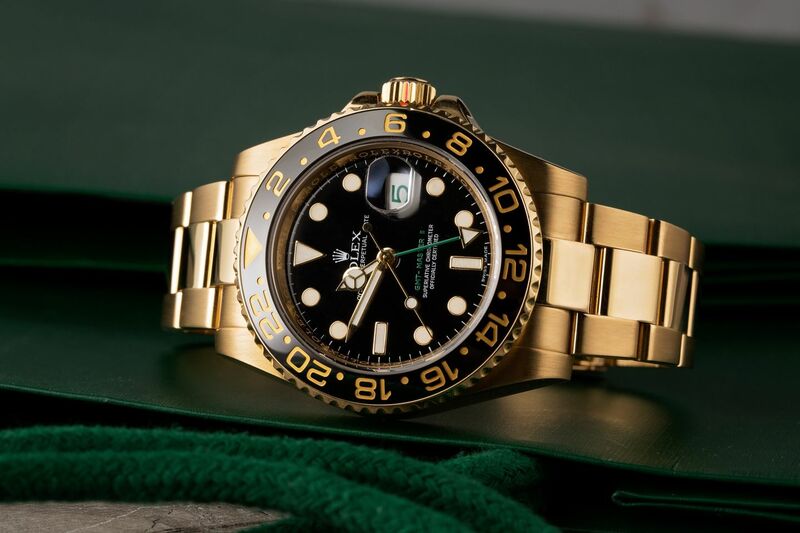 Solid yellow gold Rolex sports watches are proudly bold and decadent, and to highlight these ultra-premium, ultra-capable statement pieces, here are some of our favorites right now! Is it a dive watch? Is it a status sports watch? Is it a solid gold timepiece? The Submariner Date ref. 116618 is all of that and more. 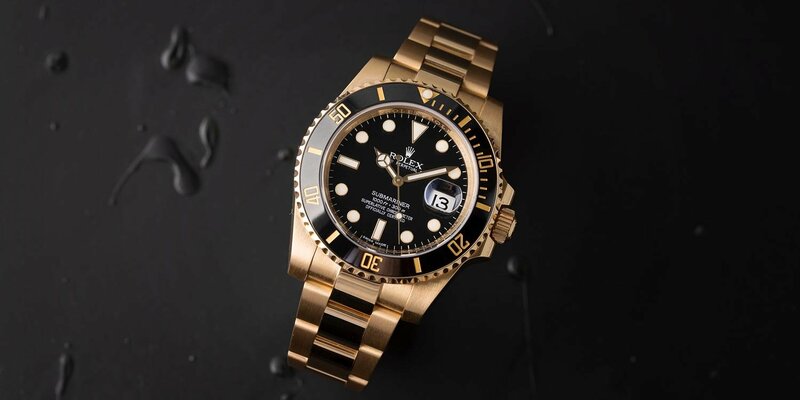 The most current version of Rolex’s famous diving watch in full yellow gold certainly houses all the necessary features to qualify as a dive watch – water resistance to 300 meters, a unidirectional rotating bezel, plenty of luminescence for legibility underwater, and a bracelet that can extend to fit over a dive suit. Yet, its precious 18k yellow gold construction may make the wearer think twice about taking it on a dive. Sitting on top of the 40 mm Oyster case of the Submariner Date ref. 116618 is a Cerachrom ceramic bezel insert, which is well-suited to scuba diving life, thanks to its resistance to scratching and fading. Rolex offers the Submariner 116618 in two colors: the LN with a black dial and black bezel and the LB with a blue dial and blue bezel. In 2005, Rolex selected the GMT-Master II 116718 to debut one of its most important modern design innovations – the Cerachrom (ceramic) bezel insert. Prior to 2005, the bezel inserts in Rolex sports watches were made from aluminum; however today, they have all been replaced by ceramic. And it was the yellow gold GMT-Master II ref. 116718 that started it all. Along with the ultra-modern Cerachrom bezel, the GMT-Master II ref. 116718 paved the way for the completely redesigned Rolex pilot watch models featuring a heftier (but same official 40mm size) “super case,” a “maxi dial” with larger dial details, and the upgraded Caliber 3186 automatic movement. The very first GMT-Master II 116718 watches were launched as a 50th anniversary model and as such, came fitted with a green commemorative dial. However, Rolex offered the GMT-Master II 116718 with a black dial as an option just one year later. With its familiar silhouette comprising of a 40mm Oyster case, a pair of screw-down chronograph pushers, a screw-down winding crown, an engraved tachymeter bezel, and a three-link Oyster bracelet, the Daytona is one of the most famous luxury chronographs ever made. As a result, Rolex manufactures their signature chronograph in all their metal options including steel, platinum, and three different shades of gold. 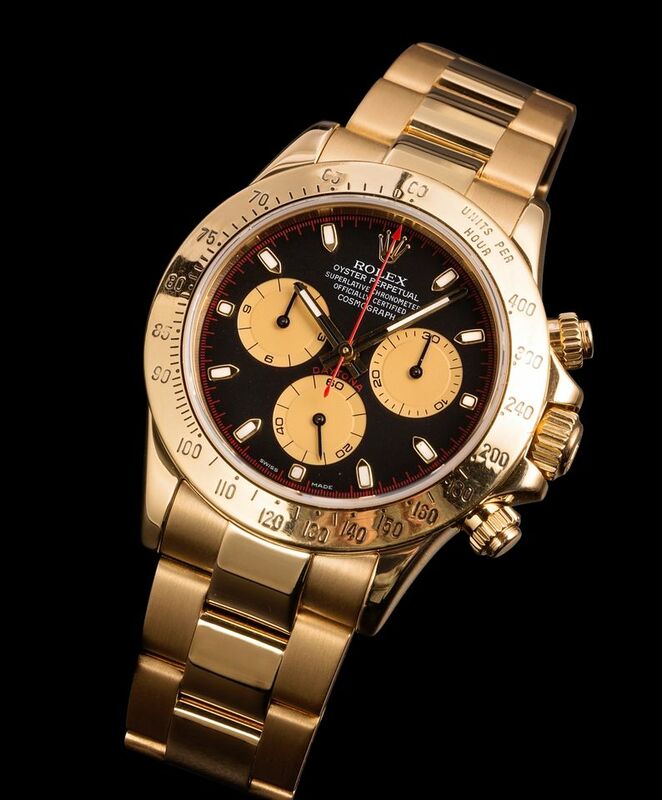 However, it’s the yellow gold versions, such as the Daytona ref. 116528, that really make an impact on the wrist, thanks to its gleaming metal. Available with a range of dial options, from standard black or white to tri-color Paul Newman tribute dials – to fancy mother-of-pearl and meteorite surfaces, a yellow gold Rolex Daytona ref. 116528 is a heavy-hitting luxury watch to wear and own. From the outset, the Yacht-Master was always positioned as an ultra-lavish Rolex sports watch. As a matter of fact, when Rolex first introduced the new nautical-inspired watch collection in 1992, it did so with the full yellow gold Yacht-Master ref. 16628. Sporting a yellow gold 40mm Oyster case, a yellow gold rotating bezel with raised numerals, and a yellow gold Oyster bracelet, the Yacht-Master ref. 16628 flaunts its luxuriousness comfortably, while still maintaining its sporty appeal. Although Rolex discontinued production of the Yacht-Master ref. 16628 in 2011, it remains a coveted yellow gold sports watch in the secondary market, thanks to its fantastic and flashy design. 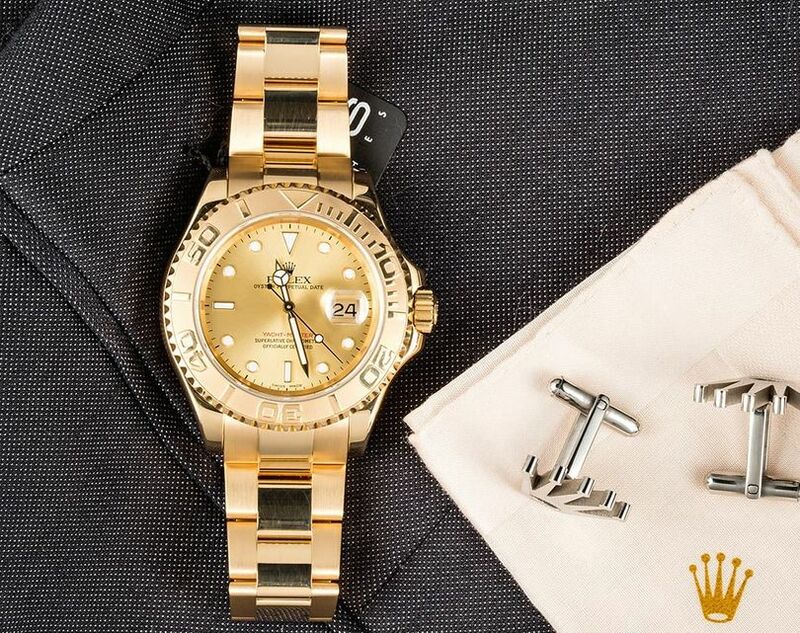 Part sporty and robust, part luxurious and precious, a yellow gold Rolex sports watch offers the best of both worlds. 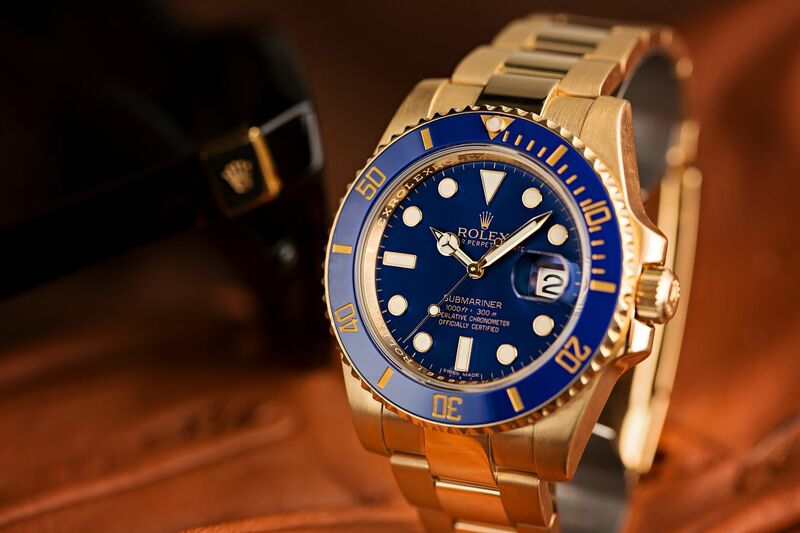 Do you like yellow gold Rolex sports watches? If so, which is your favorite one? Tell us in the comments below!